Douglas County Libraries is known nationally as a library leader and known internationally for Avant-garde approaches to information creation, curation and publishing. When DCL revealed their vision for expanding their District, studiotrope teamed with Anderson Mason Dale Architects to explore how three new libraries could fully manifest DCL’s brand and initiate a dialogue with the future of libraries on a higher level. 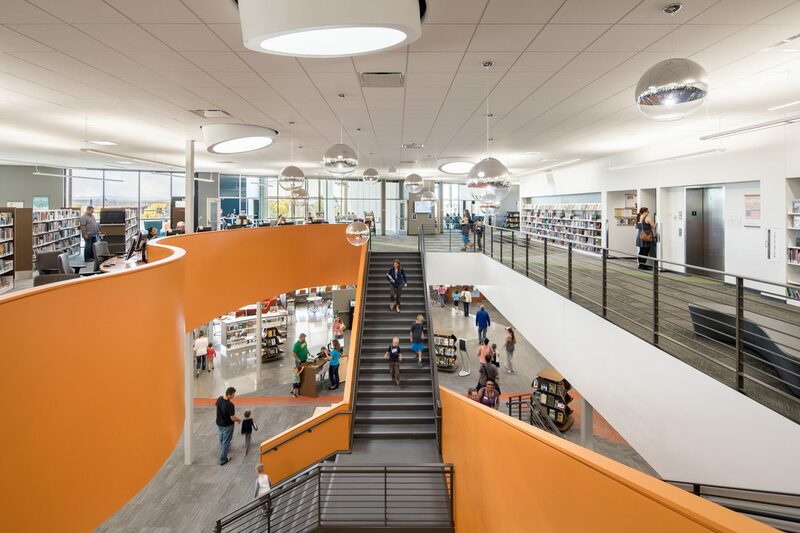 Several core trending experiences were explored in an effort to define the “unexpected” library journey; Integrated Family, Classic Library with a Twist, and Community Center. In a district where branches inhabited former grocery stores, bowling alleys and retail spaces, DLC was eager to establish “common themes,” or a pattern of language for the program, construction and aesthetic to support the evolution of their brand. Architecturally, AMD established a language that articulated volumes beyond the façade to create defined spaces within the floor plans. These new volumes create human scale spaces while maximizing views and indoor/outdoor connections throughout. Studiotrope’s interior design studio designed an intersecting line pattern that used juxtaposition to defined space while inviting exploration. Each intersecting line creates programmable spaces without boarders to reinforce the idea of marketplace synergy. Studiotrope’s graphic design studio then worked on tying the themes together by connecting these patterns to architectural elements to draw users in and encourage exploration. They also developed an intuitive signage system that allows users to navigate and discover independently without adding overwhelming visual elements. Floorplans illustrate how carpet patterns, colors and interior architectural elements achieved the desired "look and feel" brand alignment DCL was seeking across all three new branches. The design process involved DNA diagraming and concept renderings to help capture elements of the "look and feel" that could be branded to create consistency and a sense of place that connected to DCL. Slated wood elements at the entries denote the Community Center zone. Each library has a "Fun Conference Room." Parker and Castle Pines Libraries are called "The Loft." Lone Tree Library has more of a maker space vibe and is called "The Studio." Each Children's area includes a "story time" area that can be enclosed. Each library has rooftop outdoor space.